Nicola Sturgeon has called on MPs in Parliament to seize control of Brexit from a beleaguered Theresa May, as she joined an estimated one million campaigners in London demanding a second referendum. 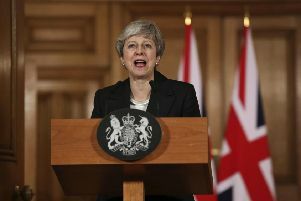 It came as it emerged that opposition MPs working to secure a second EU referendum are now in talks with Conservatives who are prepared to clear the way for a People’s Vote as the pressure grows on the Prime Minister. The Scottish First Minister joined London mayor Sadiq Khan, Labour deputy leader Tom Watson and former Tory Cabinet ministers as she addressed supporters of a second vote on Brexit in a rally outside Parliament yesterday after a march through the streets of London. Organisers claim up to one million took part. The EU has agreed to extend the UK’s originally scheduled departure this Friday, but with May’s deal poised to be rejected again, the situation remains mired in uncertainty. Labour leader Jeremy Corbyn’s absence from the People’s Vote march yesterday was widely criticised and underlined the lack of consensus on a way forward on the constitutional impasse. 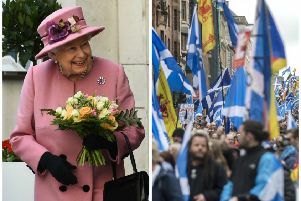 Sturgeon received widespread cheers as she addressed the campaigners in Parliament Square yesterday afternoon. “Parliament should take back control,” she said. Watson was the only senior Labour figure at the rally and pledged to back a People’s Vote, amid concerns that Corbyn remains unconvinced. “We are one million strong,” Watson said. Khan said it was “time to withdraw Article 50”. Liberal Democrat deputy leader Jo Swinson joined protesters, along with senior Tories Dominic Grieve and Justine Greening, as well as Anna Soubry of the recently founded Independent Group at Westminster and Green MP Caroline Lucas. The House of Commons may get the opportunity to vote on a second referendum this week, despite a recent Commons vote which saw the proposal heavily defeated by 334 votes to 85, when Labour abstained. However, even with every Labour MP voting in favour, the bid for a new referendum would have failed, meaning Conservative opponents of a People’s Vote must be convinced to change their minds, or at least abstain, for it to have any hope of being approved by Parliament. Senior figures in the SNP and Labour said they have spoken to Tories who previously rejected a People’s Vote, but are now willing to allow it to pass the Commons. SNP Westminster leader Ian Blackford said a number of Conservative MPs had privately told him they supported a second EU referendum, but would only vote in favour once Labour is committed and a People’s Vote is likely to win Commons approval. “It is the right thing to do to go back to the people, and I actually believe that if we had that unity across the opposition benches, that would put pressure on a number of Conservatives,” Blackford said. Opposition leaders met with Corbyn this week and emerged disappointed, saying he insisted that a public vote could only be called if Labour’s proposed Brexit deal was on the ballot. A senior Labour MP told Scotland on Sunday that the internal battle over a second referendum was being won by shadow Brexit secretary Sir Keir Starmer and shadow chancellor John McDonnell, who back a People’s Vote, over Corbyn and his official spokesman, Seumas Milne – both of whom hold Eurosceptic views. “When it comes to a People’s Vote, it’s Starmer and McDonnell vs Milne and Corbyn. Bit by bit, we’re shifting things slowly inside the party so that their views are irrelevant and their position becomes untenable,” said the frontbench MP.